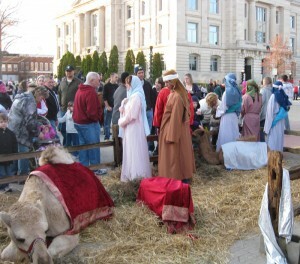 Christmas on the Square has become such a cherished holiday tradition for so many people including visitors that you would think organizers wouldn&apos;t want to mess with it. But I’m so glad they did this year because they&apos;ve added a new component that I am excited about. Clarence the Christmas Camel will descend on Danville turning the historic Hendricks County Courthouse Square into a storybook this holiday season with the unveiling coming during this year’s Christmas on the Square event from 4 to 6 p.m., Nov. 29. 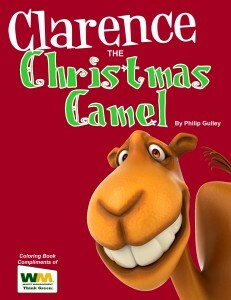 The Downtown Danville Partnership asked local author Philip Gulley to write the holiday story. They then took his story, turned it into a 30-page book and asked local artists to help display it visually on windows around the Courthouse Square. About 25 local artists from diverse backgrounds and mediums will bring the story to life by illustrating pages on 30 acrylic panels that will be displayed around the square. Each window will have an illustration, the page number it represents and the dialogue from the story matching that page. Each illustration will include Clarence, but each will look vastly different as the Downtown Danville Partnership asked each author to give their own interpretation of the holiday camel. Phil’s wife, Joan, will host a special reading of the story to kick off Christmas on the Square at 4 p.m., Nov. 29 inside the Royal Theater. Following the reading, each window will be unveiled around the square. Page 1 will be located at the Mayberry Cafe, and the story will progress clockwise around the square ending on the northwest corner at the Hendricks County Courthouse Annex. Participants also can follow stenciled camel tracks around the square. A free coloring book will be available featuring all of the illustrations and complete story throughout the month of December until supplies last. The coloring books will be available at the Royal Theater following the reading and at four booths around the square. After the Christmas on the Square event, books can be picked up at the Mayberry Café, Gallery on the Square and the Danville Public Library. The window displays will remain up until at least Dec. 31. So bring your family and come to Hendricks County to witness the adventures of Clarence this holiday season for a one-of-a-kind experience.